Club Cafe' Cafe Racers; the Thruxton, Bobber and other custom cafe styled bikes. 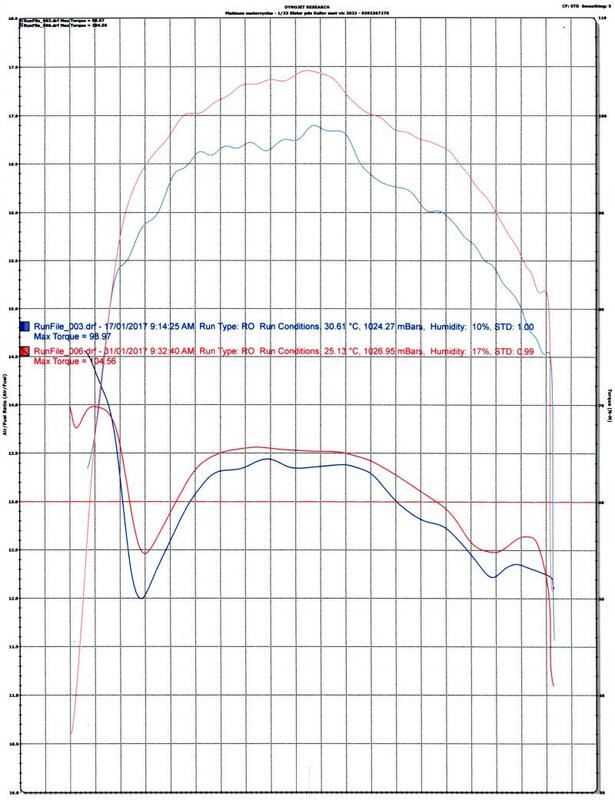 OK, so we finally got around to doing a full end to end test relating to the removal of the cat from a Thruxton 1200R, and documented each of the changes, with dyno runs and full A/F measurements. I'll be posting a full report on it all soon, but I've left the preliminary document with a tuning specialist to check all the facts and correct any mistakes I've made. That will be a more complete account of the fun, but I'll post the "too long, did not read" version here. The bike was a 2,500km Thruxton 1200R, with no modifications for the first dyno runs. The dyno was Platinum Motorcycles in Victoria (http://platinummotorcycles.com.au/) where they have a DynoJet dyno and do lots of race bike tuning. 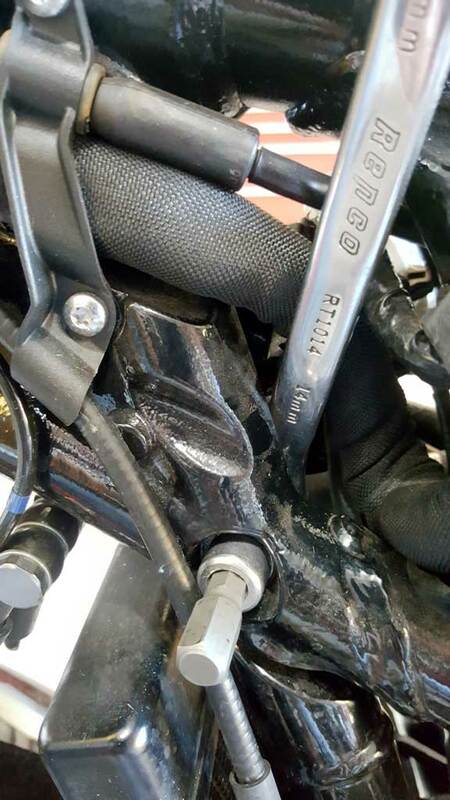 We explained that the reason this was being undertaken was to document both the default state of tuning on a standard Thruxton 1200, and the effect that changes such as de-cat and slip-ons made to factors such as A/F, performance, and responsiveness. We were sent down a cross-pipe from Meerkat to perform these tests, and Peter Herrington also sent down a set of his race slip-ons to use during the test runs. It was made clear that the results would be released even if we discovered issues, and he was perfectly happy to accept that. The products arrived the next day, and the quality of finish on these was stunning, particularly given they were hand-made. This is not a plug for Meerkat by me, but a recognition of incredibly impressive workmanship. So... here is the first dyno run from the stock bike. 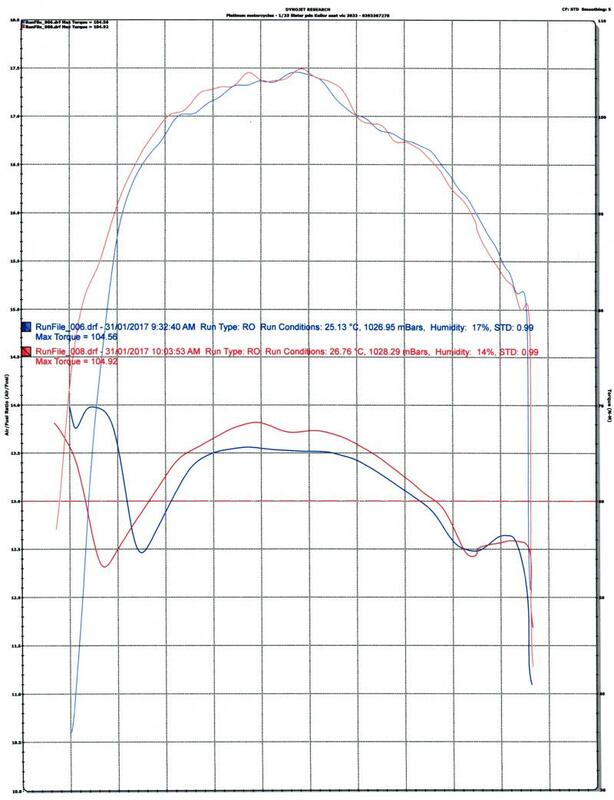 The idle/cruise/gentle throttle (in closed loop) recorded an A/F of 14.8, as expected, and this shows the AF mixture, going slightly rich, then slightly lean (from a power perspective, not relative to stoich) in the midrange, then over-rich at the top end. Next was to fit the decat (or decat the bike?). This was about 2 hours work, not all that tricky (particularly with @Fenech doing most of the work! ), and the Meerkat unit which looks like a work of art, fitted perfectly. I thought I'd also mention that the frame bolt everyone complains about is extremely easy to reach from above with a 14mm ring-spanner, so I'm not sure what all the fuss is about. As you can see, there was a huge increase in torque over the entire rpm range. This is an average of about 7% increase, from off-idle all the way to the rev limiter! Awesome stuff, and very noticeable when you're riding. The low-end pickup is stronger, without the slightly hesitant feel you get from standstill if you don't slip the clutch enough, making the feel more relaxed. Remember this is across the whole rpm range, not just the top-end, so the bike accelerates 7% faster from opening the throttle all the way to changing up, and the bike feels as though the sports mode is on because you get the same power by throttle position in standard mode. In sports mode it's even more impressive! So what about the dreaded A/F ratios? Well you can see from the chart that it is about 2% leaner (as expected, there's a less restrictive gas-flow), but it is still far below lean. The idle/cruise closed-loop remained unchanged at 14.8, indicating that the ECU loop has no issue adjusting, and the open-loop tables in the ECU are rich enough for it to simply not be an issue at all. OK, so the final step... what happens when the slip-ons are added? I honestly predicted this would make no difference, as the OEM can is relatively open with some mild 'waffling'. What's happened is that the torque has shifted slightly down, probably because the slip-ons were shorties which tend to increase low torque at the expense of top end torque. What's also interesting is that the A/F ratio has increased again by about 2%, suggesting the mild-mannered OEM cans do actually have more impact than expected, probably because of the cat removal. In spite of all this, it's still perfectly within safe tolerances, but it does demonstrate that there may be more airflow restriction at the filter side, but any additional changes will probably need a mixture adjustment to keep the mid-range A/F more optimised. 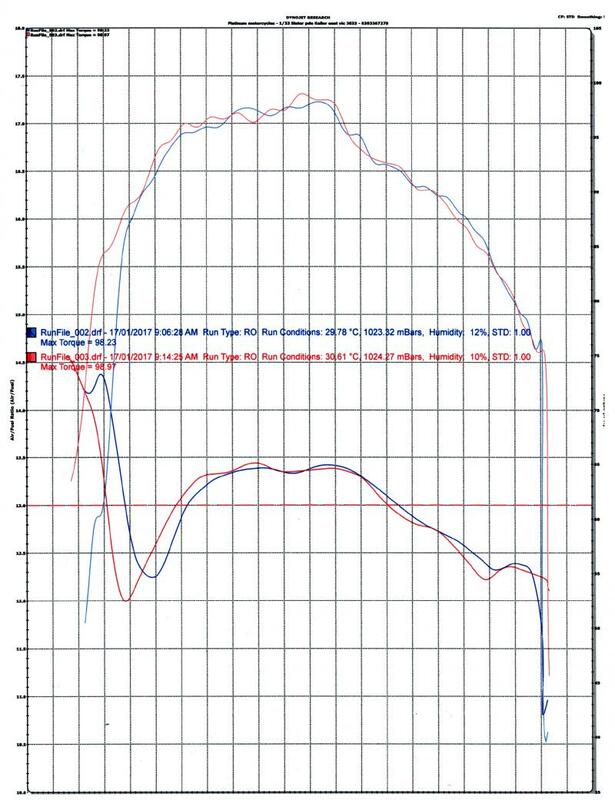 The tuning specialise at Platinum estimates an additional 6-8hp should be achievable simply by resolving the factory fuelling instability, keeping it at a constant 13ish across the whole range. If this is so (and that might be the next project) it will mean an additional 13-16% power across the spectrum. So here's the finished setup. I left the shorties on because I like them a lot. Guess I'll have to change address so Peter at Meerkat can't find me to ask for them back. Decat with the OEM exhausts is still very socially acceptable. Popping is slightly louder, but not very loud. The bike sounds like it should have done from the factory, like a highly-tuned twin with road-legal mufflers. Now decat with the slip-ons is another story. This setup is for the men, not the boys! It's not harsh or crackling like a Harley, but on idle it sounds like a classic 2-stroke, with a burble and throaty sound that is awesome. Opening the throttle wide makes a real powerful roar. Again, not horrible and painful like Harley pipes, but more like a performance tuned rally car roaring past you, and personally I think it sounds wonderful. Overrun definitely introduces popping, which can be stopped by pulling in the clutch, but again I like it. It tends to be more a set of small crackles than bangs, whereas the slash-cuts I used to use with the cat gave much louder 'pops'. So in summary, for me the bike is now really quite awesome. The power increase is very noticeable and makes the throttle response much nicer, the sound may be 10% louder than ideal for me but I just don't care, and I feel the appearance is vastly improved by removal of the dual whales and replacement with beautifully engineered hand-made mini versions of classic pipes. Sorry the TL;DR ended up so long, but after spending all this time and money researching I want to make sure I get as much info out there as possible. Make sure you allow ample time because Peter likes to discuss in detail, and you won't get away until he knows exactly what it is you want constructing, but when it arrives it's well worth the wait! TriRocket3, tsmgguy, SirCuffsalot and 38 others like this. Last edited by jsobell; 02-01-2017 at 05:52 AM. 2016 Triumph Thruxton R - Finally feel like I belong! Awesome write up jsobell. Your thoughts on the end result is exactly how I feel about mine. Simply put the changes do what Peter from Meerkat said they would. I'll let you know when I have replaced my air filter and have the PCV fitted and dyno tuned. Stand by. Once again glad to help and great detailed write up. "You were hauling along when I came past you"
Excellent post. Great data here. Thank you @jsobell for making this post. Cheers for that, looking fwd to receiving my de-cat pipe, bikes been stripped down for two weeks already! hopefully come next week. Great post.... I am still waiting until we can see a fully tuned bike. This however seems promising. Don't we need it?? If I understand correctly, balancing the backpressure between the independent exhaust increases power and reduces resonance. That's what I was thinking. Independent duals have been proven to be less effective in most setups...Atleast from what I have read.